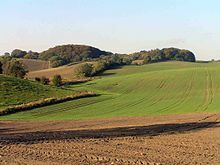 The Danes were a North Germanic tribe inhabiting southern Scandinavia, including the area now comprising Denmark proper, and the Scanian provinces of modern southern Sweden, during the Nordic Iron Age and the Viking Age. They founded what became the Kingdom of Denmark. The name of their realm is believed to mean "Danish March", viz. "the march of the Danes" in Old Low German, referring to their southern border zone between the Eider and Schlei rivers, known as Danevirke. The origin of the Danes remains undetermined, but several ancient historical documents and texts refer to them and archaeology has revealed and continues to reveal insights into their culture, beliefs, organization and way of life. The Danes first appear in written history in the 6th century with references in Jordanes' Getica (551 AD), by Procopius, and by Gregory of Tours. They spoke Old Norse (dǫnsk tunga), which the Danes shared with the people in Norway and Sweden and later in Iceland. In his description of Scandza, Jordanes says that the Dani were of the same stock as the Suetidi ("Swedes") and expelled the Heruli and took their lands. The Old English poems Widsith and Beowulf, as well as works by later Scandinavian writers (notably by Saxo Grammaticus (c. 1200)), provide some of the original written references to the Danes. According to the 12th-century author Sven Aggesen, the mythical King Dan gave his name to the Danes. Silver coins from Ribe (c. 710-20). Odin and Christian cross symbols (left) and Norse pagan fantastic animal (right). Odin of Lejre. An Odin silver figurine (c. 900). Hiddensee treasure. Golden jewellery mixing Thor's hammer and the Christian cross (10th century). Site of the earliest Iron Age hall of the Danes in Lejre (c. 550 AD). The hall is outlined by darkened soil. From around 800 AD, the Danes began a long era of well-organised raids across the coasts and rivers of Europe. Some of the raids were followed by a gradual succession of Danish settlers and during this epoch, large areas outside Scandinavia were settled by the Danes, including the Danelaw in England and countryside and newly established towns in Ireland, the Netherlands and northern France. In the early 11th century, King Cnut the Great (died 1035) ruled the extensive North Sea Empire for nearly 20 years, consisting of Denmark, England, Norway, southern Sweden and parts of northern Germany. In the British Isles, Danes landed three Viking ships at the isle of Portland, Dorset in 786 AD, where they met and killed a local reeve and his men. [note 1] In 793 AD, a Viking raid and plunder of the monastery at Lindisfarne took place,[note 2] but no further activity in England followed until 835 AD. In that year, the Danes raided and built a permanent camp on the Isle of Sheppey in south east England and settling followed from 865, when brothers Halfdan Ragnarsson and Ivar the Boneless wintered in East Anglia. Halfdan and Ivar moved north and captured Northumbria in 867 and York as well. Danelaw – a special rule of law – was soon established in the settled areas and shaped the local cultures there for centuries. Cultural remains are still noticeable today. Viking ships on the Normandy coast. Scene from the Bayeux tapestry. The first known Viking raid in what now constitutes France, commenced in 799, when an attack was fought off on the coast of Aquitaine. Several other smaller skirmishes with aggressive Vikings from primarily Danish territory have been recorded, including the first raid on the Seine in 820, but it was not until the year 834 before Viking activity in France took off on a grand scale. In that year, Danes established a lasting base on Noirmoutier island, a central spot for the European salt trade at the time, and poured into the Loire Valley on larger raid expeditions. Many large scale raids followed all across the coasts and in-land rivers of Western Europe in subsequent decades. Beowulf: "dena land", 'the Danes land'. From a copy around the year 1000. ^ The Vikings in Dorset might perhaps have originated from Norway and the exact time of the event is unclear, it took place between 786-793 AD. See "The Vikings in History". ^ These Vikings emerged from Norway. ^ Rollo was most likely from Norway himself and the new settlers in Normandy were not Danes exclusively. See "A History of the Vikings". ^ Anderson, Carl Edlund. "The Danish Tongue and Scandinavian Identity" (PDF). p. 1. Retrieved 4 November 2013. Icelandic writers (who provide the bulk of our surviving documentation)commonly employed the term dǫnsk tunga (literally 'Danish tongue') to identify the language not just of those who were ruled by the Dana konungr, but of all Germanic-speaking Scandinavians. ^ a b Described in "Hvad troede de på?" ^ In northern Germany, the North Sea Empire included the area we now know as Schleswig-Holstein and the island of Rügen. ^ F. Donald Logan: The Vikings in History, p.22-24, Taylor & Francis (2005). ^ "The Vikings in Ireland: 800AD–1169". DoCharra.com. Retrieved 10 February 2016. ^ Peter Hunter Blair (1990). The World of Bede (2nd ed.). Cambridge University Press. p. 28ff. ^ See "Viking Trade and Settlement in Continental Western Europe". Niels Hybel, ed. (2003). "Danmark i Europa (750-1300)" (in Danish). Museum Tusculanum Press, University of Copenhagen. Iben Skibsted Klæsøe, ed. (2010). "Viking Trade and Settlement in Continental Western Europe". Museum Tusculanum Press, University of Copenhagen. 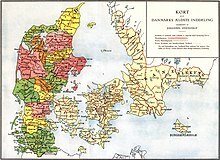 Wikimedia Commons has media related to Danes (Germanic tribe).